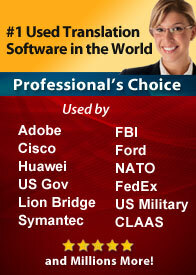 Translation Software - The key ingredient in any translation software is the translation engine. 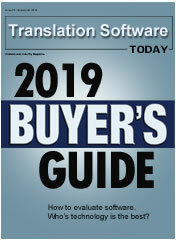 Software companies that develop translation software start with the translation engine and then add additional tools and features that make it easier to use and integrate with other products. For example tools such as, larger dictionaries, plug ins for Microsoft Word, Outlook Email, Power Point, Excel, Chat, Website translation on the fly or Web pages, file filters for support for Html, Doc, RTF, PDF and more. These features can be very important for increasing productivity and reducing costs in a business environment. Dictionary (Lexical lookup) - Process of looking up terms in the software's dictionary. When choosing language translation software you should look at the number of terms in the dictionary. A good translation software will allow you to add additional terms and phrases. The lack of this feature will limit the ability to increase the accuracy of the translations. Grammar / Linguistics Analysis - Every language in the world has its own distinct grammar rules. Good language translation software should be able to look at the grammar and sentence structure to determine the proper translation. Grammar is part of the general study of language called linguistics. Under the heading of grammar a there is a subset of items that are also very important, for example phonetics, phonology, morphology, syntax, and semantics. Semantics based methods - Semantics is the meaning or the interpretation of a word, sentence, or other language form. So good software must be able to perform complex analysis of text in order to convey the proper meaning in the translation results. Linguistic rules based methods - Machine translation can use a method based on linguistic rules, which means that words will be translated in a linguistic way - the most suitable (orally speaking) words of the target language will replace the ones in the source language. Statistical methods - The ability to use mathematical and data statistics from the database. This system allows you to pull matching pairs. The amount of time to do matching does require more cpu power and storage space. These systems are very large. Translation Memory Tools - A Translation Memory tool is really a database of text phrases or segments in a source language and their translation into a target language. Basically think of this like a search and replace, if the software sees a phrase that is in the database it can replace it. Many language translators use memorization tools to increase productivity and perform repetitive tasks when translating documents. Some translation memory tools attempt only literal matching to retrieve the exact match of a sentence, while others use fuzzy matching algorithms to retrieve similar target language strings, flagging the differences. Some memory tools are more robust than others, some people may prefer a more literal approach while others may want the software to try and perform fuzzy match results. Dictionary entries - A large database of terms the software can pull from is important, a word must be in the dictionary before it can be translated. Even though good translation software uses word phrasing / grammar it must also be able to do single word translation. There are millions of words in each language and each year more words are added. There are at least 10,000 new words that have been added to the English language with the development of the internet alone. You will often see the terms, Source Language and Target Language. If you are translating Spanish to English, Spanish is the source and English is the target. Good translating programs allow you to see the source and target side by side, this makes it easier to edit and less likely to get lost in a sea of words if you do not know one of the languages. Even though you can do research and find the best translation software on the market, it still cannot completely replace a human translator, language is too complex. Each year translation software just keeps becoming more accurate. Language translation software can be an extremely useful tool to reduce translation costs and improve productivity. Just the fact you can take a document and translate it in seconds to give you the gist of what is being said is nothing less than a technological miracle. The fact you can tailor the software to your needs or subject matter by adding words and phrases to the dictionary can make it even more accurate makes it even more invaluable to many companies worldwide. One other fact you should know, even human translators are not 100% accurate. If you have had any experience working with translators you will find that they can often translate a document and give results that are incorrect or misunderstood. Usually this is due to the different dialects. Using the power of your computer as a personal translator gives you the ability to translate foreign languages, everything from personal documents to business letters to email. Translate web pages, letters, business correspondence and more into Spanish, French, Dutch, German, Portuguese, Italian, Japanese, Chinese, Russian and Korean. With Systran language Translation Software you have the power can add your own words to the dictionary increasing the translation accuracy. Best of all you can retain the documents original design.